Chocolate and mint is a classic flavour combination, adding a little fresh mint and chopped chocolate to the buttercream for this Fresh Mint Chocolate Cake takes it to a whole new minty level! My mother-in-law has a passion for chocolate mints, you can offer her pralines, truffles, cream centres or chocolate toffees but she would far rather have a chocolate mint. 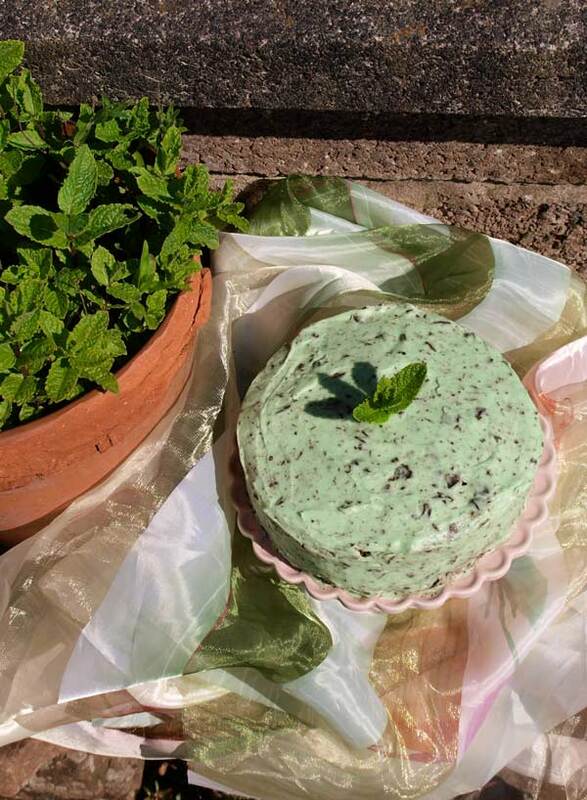 Her birthday is in early June so my fresh mint plant has plenty of leaves and inspired me to make a celebratory Fresh Mint Chocolate Cake. My mint plant was rescued from the front of a ruined cottage at the top of one of our fields. It grew by the door of the cottage, and I like to think of it being planted there by the person who lived there. I can just imagine someone coming out of the door to pick some mint to make mint sauce for their roast lamb. 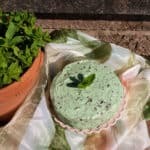 If you don’t have any fresh mint, you can make the cake without it as it also has some peppermint essence in the buttercream, but the fresh mint seems to be enhanced by the peppermint essence and vice versa. Rich chocolate cake, filled and covered with a mint and chocolate buttercream with a little bit of fresh mint zing! Blend the cocoa powder in a bowl with the hot water and leave to cool. Put the butter, sugar, flour, baking powder and eggs in a large bowl, add the cooled chocolate mixture and, using an electric mixer, beat until smooth. Divide equally between the two tins, smooth the top, and shake or tap the tins to evenly distribute the mixture. Bake for 20-25 minutes until the sponges start to come away from the sides of the tins and spring back when the centre is pressed. Leave in the tin for 3-4 minutes, then turn onto a rack to cool. The cakes must be completely cool before icing, and even better if you can leave it till the next day. Put the butter in a large bowl and beat until soft. Gradually add the icing sugar until it starts to come together then add the milk and flavourings. Beat again until you have a spreading consistency. Add the green colouring paste and beat until you have a consistent pale green colour. This quantity will fill the sandwich cake and cover the top and sides. No further decoration is really needed but you could add some chocolate curls and as sprig of fresh mint. Tip: To smooth the buttercream, keep a mug or jug of hot water beside you and regularly dip your metal palette knife (or other flat knife) into the hot water, dry on kitchen paper and when you are spreading on the buttercream, the heat in the knife will help to slightly melt it, giving a smooth finish. I’m entering the Fresh Mint Chocolate Cake for We Should Cocoa, the monthly link up for recipes using chocolate and cocoa. We Should Cocoa is run by Choclette at Tin & Thyme, why not visit and see all the lovely recipes there? I’m also sharing this recipe with the #GBBOBloggers2018 and #GBBOBakeoftheWeek Linky as I am really loving this series of The Great British Bake Off and want to share this great recipe. Aw thanks Victoria, it was a huge success! My favourite flavour, never had it as a cake! Time to remedy that immediately! 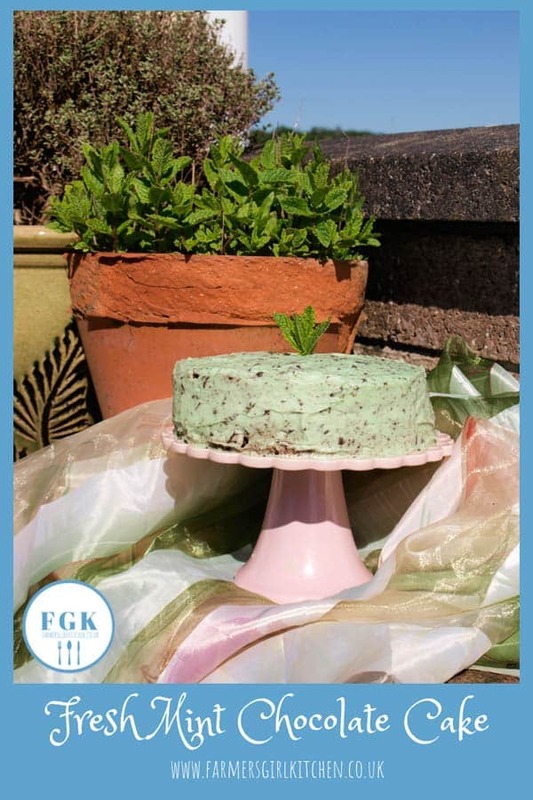 What a super fabulous idea to use fresh mint in the buttercream. The cake looks so pretty. I must say I’m very partial to mint chocolate too so I reckon I’d be very happy with a slice of this. 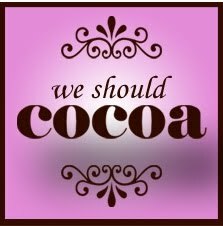 It would also make a fantastic entry to #WeShouldCocoa – just saying! Thank you. Yes, it would be a good entry, I keep forgetting about the linky things. I’ll go and sort that out now! Fab Janice. Thanks for sharing with We Should Cocoa. Delicious! I am feeling inspired for all sorts of chocolate mint combinations! Oh my! I’d never thought to do this and my lot LOVE mint chic chip everything! Thanks Chris, seemed like a no brainier to me. I’m the same when I see other peoples recipes that’s what so great about the Internet and food blogs in particular. Or, even, mint CHOC chip – we don’t eat chicks! That looks like a great cake and you have added some great cakes from other bloggers too. Thanks Karen, you can’t beat cake! Oh yum that looks wonderful and I love that you added peppermint and fresh mint. Just gorgeous! Thanks Jac, you can never have enough mint with your chocolate! Your recipes always sound so darn delicious – especially with the fresh mint! Aw thank you Emma, that’s really appreciated. Oh, that is so luvly. I love the idea. Lately I am into multiplying the mint on our windowsill, because it is so easy. It looks like I have to try your recipe. 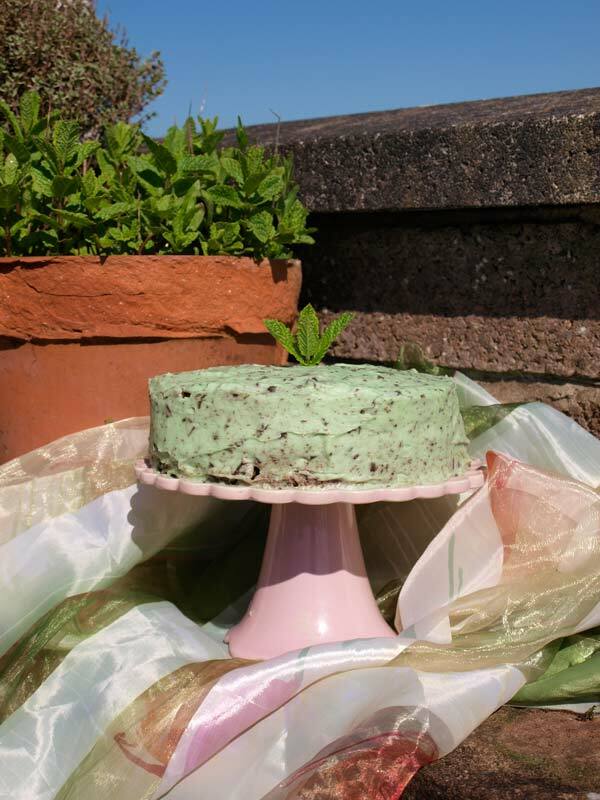 Love mint and chocolate combination and the delicate mint green colour on your cake is just beautiful (exactly the look of one of my favourite ice cream). 🙂 Could so do with a slice. Pinned for later! Thanks Jo, it is a great flavour combination, hope you get a chance to make and enjoy it. What a delightful summery cake, with beautiful flavours. I add fresh mint leaves to black tea every day, but don’t often use it in cooking, as my guys are not very keen on it. Thanks Galina, I love fresh mint. This cake looks stunning and using fresh mint just gives it that extra appeal, I bet it smells amazing too! Aw thank you Kat, I’m planning to make it again soon for when we have visitors. The cake looks delicious, amazing color to. Thank you for sharing the recipe. Thank you for your kind comments, I hope you enjoy making the Fresh Mint Chocolate Cake. The ingredients list doesn’t say how much flour or what type… eek! Wanting to make it tonight for my daughter’s birthday tomorrow! I’m so sorry, I’ve no idea where that has disappeared to. Anyway it’s 100g of self-raising flour. I hope I’m not too late for you to make it. I’ll amend the recipe.